View More In Seasonal Lighting - Page 9. Light mode : combination, in wave, sequential, slo glo, chasing/flash, slow fade, twinkle/flash, and steady on. 【100 LEDs & 44ft】- 100 warm white globe string lights. Total length is 44 feet, consist of 100 translucent globes, the diameter of each globe is 0.7 inch and spaced every 3.94 inch. 【Remote Control & Plug Control】- 2 Switch Modes are available for the led globe string lights, wireless remote control and plug control. 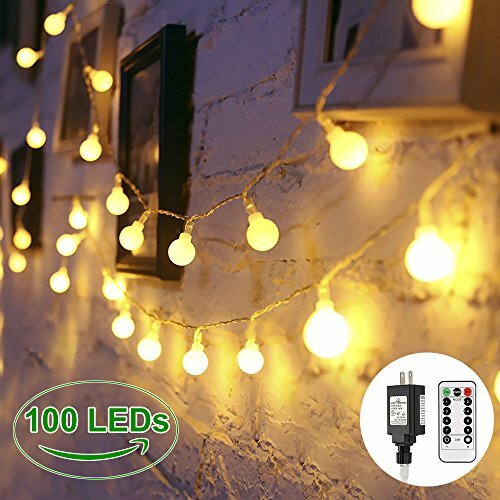 【8 Lighting Modes & Timer】- This patio globe string lights have 8 modes light sequences and auto timer function (keep on for 6 hours). 【Safety & Energy Saving】- This outdoor globe string lights is 3000K color temperature. The ball keeps at a low temperature so they are safe to touch without risk of burns after many hours of use. Don't need batteries. The LED Starry Lights are safe for children and pets. 【Waterproof & Widely Application】- IP65 Waterproof for globe string lights, IP44 Waterproof for adapter. Available for all kind of outdoor and indoor activities, such as Weddings, Garden, Tents, Gatherings, BBQ, Umbrella, Dinner Parties, Birthday Parties, very convenient for decorate and store. If you have any questions about this product by Smart&green Lighting, contact us by completing and submitting the form below. If you are looking for a specif part number, please include it with your message.